SAITAMA - The Seibu Lions looked like an unstoppable force on Saturday afternoon. The Chiba Lotte Marines, on the other hand, were hardly an immovable object. Takeya Nakamura hit a three-run home run and drove in five runs, Shogo Saito and Takumi Kuriyama added solo shots, and the Lions beat the Chiba Lotte Marines 8-2 on Saturday afternoon at Seibu Prince Dome. Nakamura had a big game, going 3-for-4, his eighth modasho (three-hit game) of the season. “I’m going to do my best to try to get more hits,” Nakamura said. 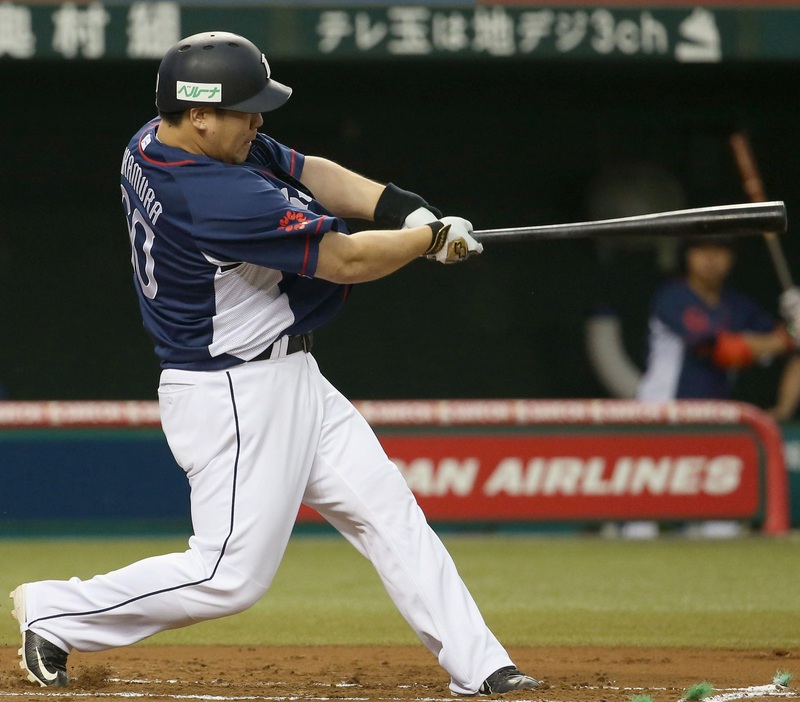 After Katsuya Kakunaka gave Lotte an early lead with a solo home run in the top of the first, Nakamura turned things around with his three-run blast in the bottom half of the inning, giving the Lions a lead they wouldn’t relinquish. “I’m grateful for that,” winning pitcher Ken Togame said of Nakamura’s big hit. The home run was Nakamura’s NPB-leading 24th of the season and second in as many games. He added RBI doubles in the fourth and sixth innings and leads Japan with 78 RBIs. Games like this are a big reason Nakamura is headed to his seventh NPB All-Star Series, which will take place later this month at Tokyo Dome and Mazda Stadium in Hiroshima. “I haven’t really thought much about that yet,” said Nakamura, not one to waste words. Kuriyama also went deep for the second straight night, connecting on a solo shot, his seventh of the season, in the fourth. Kuriyama finished 3-for-4 and drew a walk. “(Shogo) Akiyama had one hit today, but Kuriyama was able to give us a boost at the top of the order,” Lions manager Norio Tanabe said of the team captain, who bats second behind Akiyama. Akiyama’s lone base knock, a single to right, was enough to extend his club-record hitting streak to 25 games. Akiyama is now eight games shy of the NPB mark of 33, set by former Hiroshima Carp player Yoshihiko Takahashi from June 6 to July 31 of 1979. Togame (7-3) gave Seibu eight innings less than 24 hours after the team used six different relievers in Friday’s 12-inning 5-5 tie against the Marines. “We used a lot of guys last night, so I had to ask him to go deep into the game for us and he did,” Tanabe said. Togame allowed five hits, struck out eight, walked three and hit a batter. Togame, also recently named to the Pacific League All-Star team, won his third consecutive start. “I’m going to do my best to keep having winning performances going forward,” he said. It was a tiresome day for Marines starter, and former Lions ace, Hideaki Wakui, who needed 105 pitches to labor through four innings. Wakui (6-6) allowed six runs on eight hits. He struck out three and walked three. Kakunaka’s home run in the first, his fourth this year, was one of the few bright spots for the Marines. Kakunaka drove in another run with a sacrifice fly in the third. Lotte had been 4-0-1 in its last five games before losing on Saturday. Sendai — Kensuke Tanaka’s RBI triple off Tohoku Rakuten closer Yuki Matsui (1-1) broke a 2-2 tie in the 10th and Hokkaido Nippon Ham won its fourth straight, beating the Eagles 3-2 on Saturday in the Pacific League. Rakuten lost its eighth straight game for the first time in three years. Hawks at Buffaloes — ppd. At Yokohama Stadium, Kosuke Fukudome slammed two home runs to help propel Hanshin to the top of the packed Central League with a victory over Yokohama. Fukudome gave the Tigers a 2-0 lead with a solo home run off BayStars starter Shun Yamaguchi (3-2) in the fourth inning, and slammed a three-run homer in the sixth off reliever Yota Kosugi to the hitter’s background for a 6-2 lead. Yokohama took the game down to the wire, however, with Toshihiko Kuramoto halving the deficit with a two-run shot in the sixth and Aarom Baldiris’ sac fly in the eighth. The BayStars trailed by a run heading to the ninth. Matt Murton’s RBI double in the top half gave Hanshin closer Oh Seung-hwan a handy two-run lead to protect, but the South Korean, who gave away three runs with the same margin the night before in Yokohama’s walk-off victory, surrendered a home run to Taketoshi Goto for the second straight day to make it 7-6. Oh did retire the final two batters, however, with Taiki Sekine grounding out to end the game after fouling off five straight pitches. “It’s not good to get hit two times straight, so I was more careful,” said Oh, who recorded his 22nd save. Tigers starter Shoya Yamamoto (1-0) earned his first career victory after allowing two runs on six hits. The lefty came out after the fifth, when Takayuki Kajitani doubled in two runs to make it 3-2. “My pitches weren’t very good, but I was able to get by somehow on determination,” Yamamoto said. Hiroki Uemoto opened the scoring for Hanshin by celebrating his 29th birthday with a solo shot off the first pitch from Yamaguchi. Takashi Toritani’s bases-loaded RBI single made it 3-0 Tigers in the fifth. At Nagoya Dome, Yomiuri starting pitcher Miles Mikolas singled twice, scored a run and also drove in the tying run to make it 3-3 in the fourth inning. Chunichi wasted a one-out, bases-loaded chance in the 10th inning before the game was declared a tie after 12 innings. Swallows at Carp — ppd.